Ellen Gawler is a celebrated fiddler, masterful in many styles, including Irish, French-Canadian, Maritime, Shetland and New England. Her fiddling possesses sparkling clarity, authentically rooted in tradition while at the same time inventive and playful. 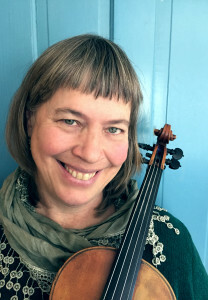 Her lively delivery of traditional fiddling has sent many a contra dance hall into whirling delight with soaring melodies and driving rhythms. In her youth, Ellen was immersed in the traditional music of Southern Vermont and New England, at contra dances; fiddle contests and Morris dancing events. In her formative years, she learned by “sitting in” with influential fiddlers, Rodney Miller and Donna Herbert and played for dances in Western Mass. with the fiddling Caynors. She was fortunate to have studied with the all-Ireland champion fiddler, Seamus Connelly, when he first came to America. She was also deeply inspired when she was quite young, by her neighbors, the MacArthur Family and when she became old enough, played at fairs and other functions with them. At age 18, she followed her fiddling passion to Ireland, playing, learning and collecting traditional tunes in spontaneous situations. Upon moving to Maine, she picked up a love for Maine French and Maritime fiddling from the old timers, Lucien Mathieu, Jerry Robichaud and Ben Guilmette, upon many occasion, playing with them at house parties and various fiddle events around the state. In 1977, through Antioch College, she ventured to Shetland for a three-month apprenticeship with master fiddler, Tom Anderson, to learn the Shetland style of fiddling, collect tunes and assist teaching in the upper Islands. She was a long time member of the legendary Maine Country Dance Orchestra, who, for 25 years, played and called for lively monthly dances in the Bowdoinham Town Hall. Ellen has also, on several occasions, toured internationally with the world music group Village Harmony. In 1978, she toured with the group, The Old Grey Goose throughout the northeastern states. She accompanied the Brunswick based dance troupe, Borovcani, providing for them the dance music of Eastern Europe. For nearly 15 years, Ellen performed widely with her childhood friend, Megan MacArthur, and Elisabeth Wolfe in the highly acclaimed folk trio, Trillium, who were best known for their intricate interweaving harmonies. She has been an original member of the acclaimed group Childsplay appearing in concert with them for over 2 decades. Ellen is currently a member of the Celtic group, Ladies of the Lake, now in their 10th year. She also performs with the fun-loving Gawler Family, playing folk music from Maine and beyond, warming the hearts of audiences wherever they go.